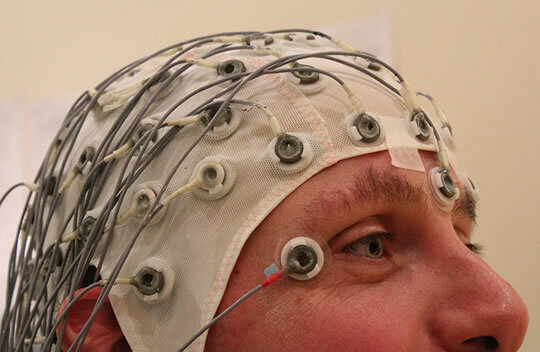 Researchers demonstrate the first ever human-to-human brain interface. Imagine if it were possible for one person to control another person’s movements over the internet, purely using their thoughts. Well, researchers at the University of Washington have managed to set up the first ever noninvasive human-to-human brain interface. Rajesh Rao, who has been working on brain-computer interfaces for 10 years, recently managed to use his brain’s electrical activity to send a signal to a colleague, over the internet, and control the other person’s hand movements. To achieve this they used an EEG machine (electroencephalography) to record the electrical activity in the brain. When the computer detected that the person was trying to move his hand, a signal was sent over the internet to a colleague sitting in a room, on the other side of the university campus. There, the receiver sat with a special type of magnet attached to his head (TMS, or transcranial magnetic stimulation coil). This coil sat over the part of the brain which is responsible for movement of the hand. The two researchers were actually using the brain interface to play a simple computer game. It took some practice, but eventually one was able to send the signal and remotely move the other’s hand at a 100% success rate. Below is a schematic of how the system worked. The full description of the experiment is here.